OSRS account combat level 58 with 40 attack, 70 strength, 1 defense, 80 ranged, 11 prayer, 51 magic, total level 698, quest points 41 with desert treasure (11 prayer) and mithril gloves done. 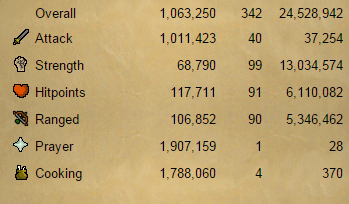 its a special pure account. trained by our own trainer, 100% no recover back. no bans.no offense. For these packages below, we will deliver the OSRS account information to you first, after you secured the OSRS account, then we will deliver the gold amount you choosed to you. Other Runescape Accounts 07 you may be interested to buy.